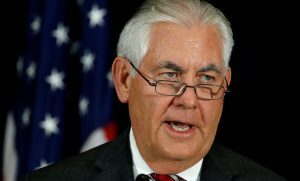 LONDON — U.S. Secretary of State Rex Tillerson on Thursday urged China to use its leverage as North Korea’s principal supplier of oil to press the isolated nation into reconsidering its development of nuclear weapons. The Trump administration sought an embargo on oil imports to North Korea at the U.N. Security Council this week in response to the North’s most powerful nuclear test to date. But opposition from China and Russia forced the U.N. to approve weaker measures, although it did ban textile exports, an important source of its revenue for the North. Tillerson said it was going to be “very difficult” to get China to consent to an embargo against its neighbor, but he still urged China as a “great country and a world power” to use its leverage as the supplier of virtually all North Korea’s oil. He spoke after talks with Britain and France on how to increase pressure on the authoritarian government of Kim Jong Un as it moves closer to having a nuclear-tipped missile that could threaten the American mainland. RELATED RESOURCE: Can a ballistic missile defense system shield Guam from North Korea? China opposes North Korea’s nuclear weapons development but worries that greater economic pressure on the North could trigger a collapse. It wants the U.S. to restart long-stalled negotiations with North Korea. The U.S., Britain and France are the other permanent members of the Security Council, the U.N.’s most powerful decision-making body. “The Chinese have done more perhaps than we thought that they would, but there is scope for them to do much, much more, particularly in respect to oil,” British Foreign Secretary Boris Johnson said. He cautioned against pursuing alternative efforts at engagement with Pyongyang — a possible reference to comments this week by German Chancellor Angela Merkel who offered to act as a facilitator, if needed, in diplomacy. Merkel suggested that the approach taken with Iran — lifting international sanctions in exchange for it curbing nuclear activities — could be used with North Korea. Thursday’s talks in London also addressed the response to Hurricane Irma, which has caused havoc in the southeastern United States and the Caribbean, where Britain and France have dependent territories. Later, representatives from the U.N., Italy, Egypt and the United Arab Emirates joined for discussions on the upheaval in Libya and a U.N.-backed mediation effort to stabilize the North African nation. Libya fell into chaos following the 2011 NATO-backed uprising that toppled Moammar Gadhafi. Today it is split between rival parliaments and governments in the east and west, each backed by a set of militias, tribes and political factions. Johnson, who visited Libya last month, said peace in Libya is “wholly achievable” and elections could be held next year, but a constitution needs to be put in place first. “Libya is a front line in our common struggle against terrorism and illegal migration, and we all share a vital interest in that country’s stability,” he said. Tillerson voiced U.S. support for the U.N. mediation effort. He said the U.S. does not want to see Libya become a safe haven for additional terrorist organizations including the Islamic State group. Tillerson also met with British Prime Minister Theresa May and discussed the threat posed to the Mideast region by Iran and the conflict in Syria.